1. Patterns are for PERSONAL USE ONLY. Any commercial use is strictly forbidden without prior written consent. 2. You will not sell, copy or give away (electronically or otherwise) any of these patterns to ANY third party. To order one or more patterns by credit or debit card, please use the 'Add to Basket' button alongside the patterns you wish to order before clicking 'Proceed to Checkout' when your order is complete. To order by cheque, please use the email form on the Order page. All patterns are £4.00 each for orders up to and including 3 patterns. More than 3 patterns is postage free. This pretty V-neck top has been made using various techniques with the cuff detail adding interest. The sample was knitted using two strands of fine crepe (available from Uppingham Yarns or Yeoman Yarns - see Links page for addresses). The pattern is written in sizes 34 - 44" (86.5 -112cm). The first size used approximately 290g plus a small amount of contrast lurex (optional); the contrast yarn could be any suitable 4-ply. Click on image to see detail of garment. This wide neck top has a slightly scooped neckline and lace sleeves. 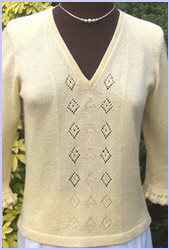 The garment has been made using Cascade from BSK Ltd (see Links page for address) but any similar yarn could be used. The pattern is written in sizes ranging from 32 - 48" (81.5 - 122cm); the extra small size used approximately 295g. 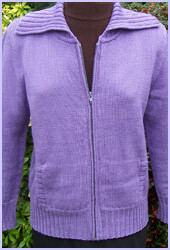 This garment has been knitted on a Brother 950i using Double Knitting (DK) yarn. This yarn knits easily on standard gauge machines at a loose tension. The zip is concealed in a neat enclosure; a must have garment for cold winter days. The pattern is written in sizes ranging from 34 - 46" (86.5 - 117cm); the medium size used approximately 490g. 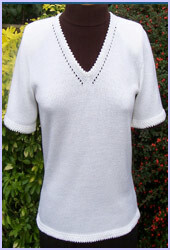 This pretty top has been knitted using three strands of fine crepe. 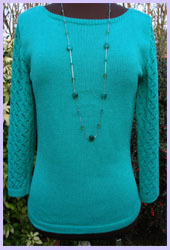 The garment is very easy to make, even if you are a beginner; the neck detail is particularly pretty. The pattern is written in sizes ranging from 34 - 44" (86.5 - 112cm); the small size used approximately 365g.